Learn what it takes to make the most of your design team. This is Chapter 3 from "Org Design for Design Orgs," by Kristin Skinner and Peter Merholz. This chapter also is included in "Organizational Design for Teams," a curated collection of chapters from the O'Reilly Design Library. In 2011, things began to turn around for NBA basketball team the Golden State Warriors. After years of apathetic leadership and poor performance, new owners made big moves, trading perceived franchise player Monta Ellis for Andrew Bogut and hiring coach Mark Jackson. The next couple of years saw more talent acquisition, such that by 2013–2014, the team had its core roster: Stephen Curry, Klay Thompson, Harrison Barnes, Draymond Green, Andre Iguodala, and Andrew Bogut. And even though they won 50 games for the first time in 20 years, they lost in the first round of the playoffs. Internal turmoil tore up the coaching staff, as Mark Jackson’s approach seemed to be one of “my way or the highway”—assistants who disagreed with him were let go, and players were pitted against each other. After the playoffs, Mark Jackson was fired, to be replaced by Steve Kerr, who installed a new coaching staff, and a much more inclusive and joyful management style that welcomed respectful disagreement in search of the best answer. Under such leadership, and with no significant roster changes, the Warriors dominated the league, winning 67 games and the NBA championship. There are two lessons for any team. The first is that skill and talent matter. By making big roster moves, the Warriors made back-to-back playoffs for the first time in over 20 years. But talent isn’t sufficient. The second lesson is that to get the most out of a team requires sensitive management, visionary leadership, and well-run operations. Design teams often suffer in this second area because, compared with other corporate functions like engineering and marketing, design is newer and its appreciation is less sophisticated. This nascency means that (a) most people in an organization have never worked with a truly effective design team, and (b) most designers haven’t been part of fully actualized teams, and so they don’t know what they need in order to realize their own potential. Many design teams have the raw talent to realize the expanded role outlined in the prior chapter, but don’t yet have the maturity to embrace it. A design team’s output is the result not only of their skill, but the sophistication and sensitivity of how they operate. In this chapter, we present a set of qualities of effective design organizations. Assessing a team’s performance against each of these qualities clarifies opportunities for improvement. The qualities are broken up into three groups: Foundation, Output, and Management (Table 1-1). The Foundation outlines the core concepts that drive the team’s behavior, and explain its very reason for being. With a strong Foundation established, energies then shift toward Output and Management. These qualities are indicative of the broader creative/operational split that is required to sustainably deliver good design, and is a theme throughout this book. Output and Management need to be tackled in tandem, as they reinforce each other. Output addresses what most people think of when considering design—is the team able to produce quality work across the necessary set of capabilities? Management addresses the unsung and often overlooked aspects of actually running a team. To realize team longevity and continued broadening impact, it’s imperative to treat operations as seriously as the work product. Often, in the rush to just get a design team in place and producing work, laying foundational components such as values, principles, and mindset is neglected. That leads to an unengaged team working without clear objectives, and efforts can feel frenetic and unfocused. Being intentional about the foundation leads to stronger work and more committed team members. Meaning and purpose are important for organizations at every level of scale. Companies have mission statements that orient and inspire their staff. Individuals have passions that motivate their behavior and decisions. Successful teams need a shared sense of purpose that establishes their identity and the impact they hope to have. One way to articulate this shared sense of purpose is through a team charter. Charters can come in all shapes and sizes, from brief mission statements to lengthier documents that detail how a team operates. Start brief and expand as needed. Every design team is different, so no one charter will apply universally. We propose the following as a way to get started. We’re not here just to make it pretty or easy to use. Through empathy, we ensure meaning and utility. With craft, we elicit understanding and desire. We wrangle the complexity of our offering to deliver a clear, coherent, and satisfying experience from start to finish. Successful teams, including design teams, have strong, formal leadership. Leaders have an intimate understanding of how the team should work, make decisions that benefit the team, and have the respect of the team’s members. They then take this internal team understanding and translate it to the rest of the organization, ensuring the team is set up to succeed within the larger whole. Because of design’s nascency as a corporate function, design leadership often receives short shrift. With small design teams, it is common for a squad of junior-to-senior designers to report to someone who is not a designer, but instead in product management, engineering, or marketing. To a certain extent, this is acceptable—small teams are often at the start of their journey, and are part of a company that is in a more fluid state. Hopefully, the company just hasn’t had the wherewithal to yet bring on a strong design leader, but knows that it ought to. More frustrating are large organizations that should know better but continue this practice. An example was a Silicon Valley company (that shall remain nameless) that had four design directors as peers, each reporting to the VP of Product Management. While it might seem that design had real presence, in actuality none of the design directors were the head of design—that VP was. And that person was making decisions that affected the design team, even though he didn’t understand the potential that design could be delivering. A design team needs to be in charge of its own destiny, and this requires focused leadership with autonomy and executive access. We’re using the phrase “focused leadership” to mean one or two people are running design and are from within the design organization—these leaders are not also overseeing other functions. While design leaders must be attentive to issues of quality, a common mistake made by many companies is that they place in this role a design visionary, a creative director with big ideas and an obsessive attention to detail. A design organization is an entity that needs care, nurturing, diplomacy, and leadership. The skills that made someone a great designer or creative director are almost wholly unrelated to the skills that make them a great manager and team leader. Instead, this design leader’s primary responsibilities will prove organizational, working with other executives to clear the path for design, and serving as a manager, mentor, team builder, and operator for the team itself, creating both a figurative and literal space where design can thrive. For most organizations, a single leader suffices. In fact, this quality was originally labeled “singular, empowered leadership,” because it’s important that there is a clear line of authority within the design organization (and not a set of supposed leaders, all as peers, reporting into a non-design role). However, as the team grows, it might become necessary to split leadership into two—one person focused on creative matters, and the other on operational. There are many examples of such a split in other fields. Technology organizations have a CTO who serves more as a software architect, and a VP of Engineering who makes sure the team is running effectively. Publications have Editors-in-Chief and Managing Editors. In filmmaking, there is the Director and the Producer. And some design teams now have a lead Creative Director and a VP of Design (these roles are explained in detail in Chapter 5). This partnership model allows the creative leader to focus and more deeply engage on the entire journey and key initiatives while allowing the operational leader to focus on portfolio planning, capacity and hiring, budgeting, and an operating plan. With focused leadership established, they must have autonomy over how the design organization works. Leadership’s overarching responsibility is to make their organization as effective and efficient as possible, and given the expanded role of design, this will likely mean it doesn’t conform to how other departments are structured or operate. This requires freedom to establish methods of practice, both internal to the design team and cross-functionally. And, finally, because design teams are always asked to do more than they have the capacity for, leadership must be able to prioritize their own efforts. For design to be seen as a truly essential contributor, it must be able to focus efforts on what matters, and say “No” to that which is not crucial. Essential in design’s ability to succeed is an authentic understanding of user contexts and behaviors. This goes beyond standard practices of market research and user testing, and toward deeper engagement with the lives of the people being served. Nothing beats going into people’s homes or offices, and following them as they go about their days. While quantitative and marketing methods such as usage analytics and surveys provide data as to where things aren’t working, findings from such efforts focus on optimizations and point solutions. Good user research, particularly out in the field, reveals a richness of understanding that you simply cannot get anywhere else. It is this work that ends up revealing a customer’s journey, and inevitably, the experiential breakdowns that happen when people try to accomplish things that require them to unknowingly cross siloed departments in an organization. The primary benefit of such observations is that designers develop empathy for their users, which in turns leads them to design systems that have real impact, and avoid solutions that will be rejected by the intended audience. A secondary benefit that can be just as important is when executives and other people with authority outside of design witness the results of such user research, whether it’s the raw data (e.g., videos of people expressing frustration with the current situation), or the analyses that makes clear problematic patterns. When these executives ask how these breakdowns can be addressed, this is the opportunity to step up and show how design, specifically service design, can propose solutions that integrate silos. Our research revealed that using ROI and other valuation methods helps to evolve design competency within organizations. The valuation methods provide tools for developing and measuring a design strategy as a component of a larger business strategy: The ability to “value” user experience design makes it a visible and credible business lever on par with marketing, research and development, and channel strategy. As a result, applying ROI-measuring techniques to user experience investment decisions has a positive impact on how [design] teams are structured and perceived within an organization. Given design’s success in the decade-plus since that report, it might seem that the value of design is understood and such practices are no longer warranted. However, for a design organization to realize its full potential, its members must still be able to speak the language of value in a meaningful way. If designers shield themselves in the cloak of “creatives” as a way not to engage with the business, they will lose impact and credibility. Designers need to understand how their work contributes to business success. Too often, designers practice design-for-design’s-sake, where what’s produced, however cool or innovative, isn’t connected with the company’s goals. Savvy design leaders embrace business value, realizing it can serve as a powerful input into the design process. Whether it’s “hard” metrics such as improving conversion rates or increasing engagement times, or “soft” matters such as representing the company’s brand in an elegant and appropriate way, these connections to what the company cares about are crucial for keeping design efforts on track. And when these business objectives are paired with authentic user empathy, new means of value creation can emerge. When design organizations propose ways to unlock new business value, their credibility and impact increases. We are finally at the place where most people begin when thinking about design—making stuff! The following four qualities address the design organization’s capability to produce sufficient, robust, and relevant work. “Support the entire journey” has a few implications. One is that the design team must have access to, and be involved with, all aspects of the customers’ journeys. This will likely require change in how the rest of the organization thinks about design, because it means the design team engages areas where it had not been considered relevant, such as the high-touch practices of sales and customer service. Another implication is that there should be only one design organization to undergird the entire customer journey. This runs contrary to a common practice, where companies often have two teams—a product or UX design team and a marketing design team. This is the legacy of 20th-century mass manufacturing thinking, where the way a product is designed and developed is divorced from how the product is sold and talked about. In a services world, this distinction no longer holds. “Marketing” and “product” experiences are simply milestones on the same customer journey. Also, whereas traditional marketing design was delivered through media (publications, broadcast, billboards) and product design was for a thing placed on a retail shelf, in a world of connected software, the platform for many marketing and product experiences has converged in digital realms such as email, web, and mobile. Granted, there are efforts particular to specific media—users don’t interact with products on a billboard—but those are relatively few, and diminishing. Companies beholden to the archaic “marketing” and “product” distinctions also get in the way of new opportunities, such as the rise of “growth” product development, where what would have been considered a classic marketing function (acquiring users) becomes part of product development. Given a single design organization invited to work end to end throughout the customer’s journey, a third implication arises: the need for a vast array of design skills to address the totality of that journey (Table 1-2). Don’t be discouraged by the breadth of this list—even most large teams aren’t so broadly skilled. Still, the design organization must be accountable and responsible for the delivery of these design practices, whether they are done by people employed full-time, or external contractors and agencies brought in on a project basis. The design of the end-to-end journey is the sum of these practices, and having a single design organization ensures that these efforts cohere. A final implication arises in recognition of how overwhelming such a broad mandate can be. In a connected-software-and-services world, to render an entire journey is a matter of managing overwhelming complexity. There are too many moving parts, too much specialized knowledge necessary to fully appreciate a situation. Designers can no longer rely solely on the hard skills of their practice and craft to succeed. They need to facilitate the creative output of others throughout the organization, tapping into a resource often left dormant. If working in a hospital setting, get nurses, technicians, and doctors to ideate around their specific problems. In a call center, have the customer service representatives pitch how they think things should be. The point isn’t to be bound to the input from other functions—the design organization still has the crucial responsibility of refining, honing, and executing these ideas. But realize that the problems we’re solving are too big for any one team to have a complete handle on. For the team to deliver to its potential, it must operate across a range not only of skills, but of conceptual scale, from the “big picture” down to the pixel and pica. 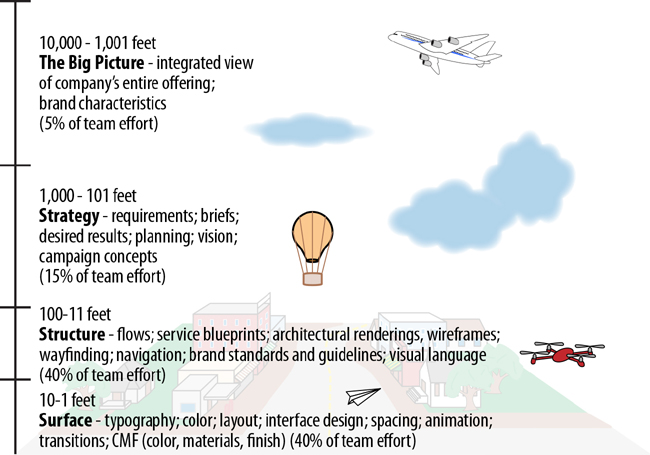 Imagine a conceptual scale that spans a product and services view from 10,000 feet to 1 foot, and place design work along that scale (Figure 1-1). The relative effort percentages are not a strict staff breakdown—while individuals will gravitate toward a particular level, most will not operate only at that level. What the percentages show is that while the effort placed in the lower, execution-focused levels will far outweigh that which is spent in the higher levels, in order for design to fulfill its potential, it must deliver across all levels. A design organization ought to be able to operate across these levels of scale regardless of its size. If the organization is just establishing an internal design function, the implication is that hiring a single designer is insufficient, because there’s no way you’ll find someone who can span all these levels competently. Instead, bring on two designers as quickly as you can, one who can take the bulk of the lower level work (spending 80% of their time in Surface and 20% in Structure), and another who can do some of that, but also engage strategically and across the organization (spending 60% of their time in Structure, 30% of their time in Strategy, and 10% addressing The Big Picture). Newly hired design leaders brought in to run an existing organization can use this model to plan their next set of hires. When Peter was hired to run design at one company, he inherited an organization whose efforts mostly consisted of turning product managers’ requirements into comps, and where user research made an impact only at the interface level. This immaturity was not imposed by the rest of the organization—product managers and engineers were eager for greater design contributions. Assessing the team’s capability, he found that it was strong in delivering at the Surface level, mediocre when it came to Structure, and pretty much non-existent with matters of Strategy. Thus, design was getting in its own way when trying to have more of an impact. This drove Peter’s decision to recruit designers who could deliver quality work at the Structure and Strategy levels. As they came onboard, design’s influence grew organically. A design organization is ultimately judged by the quality of its output. What’s tricky is that there’s no universal definition of design quality. So while “high-quality engineering” is typically considered through quantifiable metrics such as reduction of bugs shipped, speed of performance, and service uptime, “high-quality design” is understood through subjective measures rooted in personal preference and taste. Sure, design solutions can have quantitative performance measures such as conversion rates and task completion, but they are insufficient in establishing quality. The ultimate assessment of quality often exists in the eyes of the beholders. To overcome this, the design organization must be empowered to define quality standards for their team and their organization. Those standards then must be externalized so that others know what is being upheld. The goal is to take as much subjectivity as possible out of the equation, shifting design critique from a stance of personal preferences (“I really love this shade of blue”) or a desire to stand out (the infamous “make the logo bigger”) to an agreed-upon set of principles and guidelines that explain the team’s definition of quality, supported by numerous examples of design work that demonstrate good quality with callouts as to why. Once the design org has established such quality standards, they must hold themselves up to those standards, and not sacrifice. The rest of the organization will likely act in a way that unintentionally discourages quality. People outside of the design team don’t understand what it takes to maintain a high quality bar, and design teams are asked to do too many things with too few people in too little time. Too often, these teams try to do it all. Designers exhibit a couple of traits that can get them into trouble. One is a desire to please. Designers want to make others (clients, colleagues, users) happy. And so, when asked to do a thing, the default is often “Yes.” The other is a revulsion at seeing work go out without designer involvement. Even when not asked to contribute, if they see that something might be shipped that wasn’t intentionally designed, they’ll try to find a way to take part, so that what is released isn’t terrible. These intentions are good, but the results are self-defeating. Teams get spread too thin, supporting too many programs, working overlong hours, and ultimately delivering subpar work. A design organization is only as good as what it delivers, and if it is producing crap because it’s trying to do too many things, then the rest of the organization will associate design with crap. Design leaders need to wield the power of “No.” Design work should only be done when adequately prioritized and staffed, and when there is time to develop quality solutions. This should not mean excessively long schedules for rumination and exploration. Good leaders know that there are points where design practice realizes diminishing returns, where further effort no longer leads to improved results. What it does mean is empowering the design organization to uphold what it takes to deliver quality, and to decline work that doesn’t fit. Many design organizations rely on process as a proxy for quality. This is a false connection. Critical thinking is essential for delivering great work, and an over-adherence to a methodology leads to teams making unthinking decisions. While a high-level process or general approach can help designers communicate how they work with other functions, insisting on a granular step-by-step process for every project engenders a rigidity that can actually harm quality. Design problems vary, and design teams should be familiar with a range of approaches and methods to solve them appropriately. “We must follow a user-centered design process” may sound like a good plan, but when any process becomes an assumption or accepted dogma, it becomes a crutch that replaces critical thinking. Instead of following a well-trod process, design leadership should make the effort to figure out the best ways to tackle different challenges, drawing from a broad methodological toolkit. In a world where speed is often vaunted above all else, this talk of upholding quality makes some people nervous. So, “delivery over perfection” is meant to balance “establish and uphold quality.” There’s a quote attributed to Steve Jobs during the development of Macintosh: “Real artists ship.” This recognizes that even the most masterful craftspeople, if they are actually hoping to have some kind of impact, must stop what they’re doing and get their work out into the world. Designers can have trouble realizing that delivery is just part of an ongoing process. For those who went to design school, every time they made something, they had one chance to get it right. And even digital design practices have their roots in traditional media, where once something is produced, it’s in the world and out of your hands. This background encourages perfectionism, with a concomitant unwillingness to ship until you get it just right. With connected software and services, delivery should be frequent. By making delivery a habit (and not a rare event), the idea of The Launch loses its paralyzing power. That said, continuous delivery should not be an excuse to ship bad stuff, with the notion of fixing it later. This is another place where leadership comes into play, because striking the right balance between quality and delivery is a matter of judgment. At IBM, they teach designers how to recognize when something is “ready,” because with software, you’re never really done.3 That recognition of ready should discourage designers from noodling in the pursuit of an elusive ideal. Labeling something as “ready” may upset a team who doesn’t believe the design is good enough yet, but ultimately the best way to gauge quality is not some internal assessment, but use by real people. A seriously underappreciated aspect of the long-term health of a design team is its management. Design leaders are rarely trained as managers, and lack familiarity, and sometimes interest, in the nuts and bolts of running their team. Without sound management practices, a design team turns into a hornet’s nest of disillusionment, putting the quality of the team’s output in jeopardy, and risking retention. The department name “Human Resources” demonstrates how many companies think of their employees—not as people, but as economic units whose role is to contribute to a company’s productivity. Design leadership must make the effort, which can run contrary to the broader organization’s approach, to engage the team members as people. In return, those team members will be committed and engaged in the work for the long haul. Three characteristics indicate a nurturing team environment, one where team members will be less likely to leave and will be their best selves when working. Are team members respected as individuals? A byproduct of bureaucratic work environments is that they encourage treating employees as cogs in a machine, not as the idiosyncratic people that they really are. Job titles imply equivalence and interchangeability for anyone with the same title. Discrete numbered levels are used to assess seniority and salary ranges. Org charts delimit access and authority. Actualized design teams overcome such practices by treating team members as individuals, with all the messiness implied. They recognize job titles are imperfect, and two people with the same title may have different skills. That’s OK, though, because everyone knows those people’s strengths and weaknesses, and makes sure that they’re set up to succeed. Seniority levels are seen as guidelines, not strict containers. Reporting structures are there for communication and mentorship, and do not limit anyone’s ability to share ideas and have an impact. While maintaining this individualistic perspective is challenging as the design organization grows, it’s worth the effort. Designers, perhaps more than other professionals, are a sensitive, empathetic, expressive, and quirky bunch. Reducing them to labels and levels removes their individuality, blunting their engagement and, in turn, their work. Instead, celebrate their individuality. Let their freak flags fly. Do team members work reasonable hours? There’s a difference between working hard and working long. The best work environments keep team members fully engaged during work, but do not expect people to commit 50, 60, 70 hours of their weeks. Overly long work weeks deliver a double whammy to designers—along with the obvious struggle with work/life balance, designers, as creative professionals, need to disconnect in order to recharge. Constant production and overlong hours stagnates work quality, as designers rely on what is basic and safe. Productivity can even go backward—poor decisions designers make while fatigued have to then be undone before the team can move on. Are team members encouraged to grow? A natural mistake made by design managers is to build a team of people who look and act just like them. It’s what they’re comfortable with, what they know, and because they have succeeded, it stands to reason that others just like them will, too. This leads to staffing a team of clones, solving problems in a similar fashion, restricted by groupthink, and limiting exploration by aligning on solutions too early in the process. Key to successful design process is a period of divergent thinking, employing practices that open up a problem space. To achieve meaningful divergence requires that those doing the work come from a diversity of perspectives and backgrounds. Approaching a problem from a range of angles reveals solutions that may otherwise remain hidden. Twenty years ago, there were few schools for software design, so people gravitated to it from a range of backgrounds—the founders of Adaptive Path had degrees in history, journalism, anthropology, and filmmaking. Now, as software design becomes further professionalized, with more schools producing more graduates, the risk is that the processes taught become dogma, leading to a narrowing mindset of how to solve design problems. Thankfully, counterbalancing this are mid-career programs such as General Assembly and Tradecraft, which attract people who had initially considered different careers. Avoid hiring graduates only from the same limited set of schools, and instead cast the net wide. While design professionals are roughly split 50/50 across male/female lines, it’s not uncommon for more technical product design teams to exhibit the same lack of gender and racial diversity of their broader organization. When Peter joined one company, he inherited a product design team of 11 men and 2 women, almost all in their mid-20s. Peter witnessed how this narrowed the team’s worldview, with expectations that users had a degree of savvy with mobile and web conventions as they who were born digital. However, the company’s audience was overwhelmingly female and middle-aged. And while a design team shouldn’t necessarily reflect its user base, and user research can go far in engendering empathy for those different from ourselves, by having a variety of perspectives and backgrounds represented, designers are encouraged at all times to check their assumptions. Also, on that team of young people, all but one were white. Race and ethnic diversity have long been challenges for the design industry, and very little has changed in the 20 years the authors have worked in the field. It’s not an easy problem to solve, because even those eager to hire for diversity are hindered by the lack of diverse candidates. And diverse candidates might find themselves subject to unintentionally biased recruiting, interviewing, and promotion practices. Making change will take time. Work with grade schools as well as universities, introducing design as an exciting, important, and inclusive field of practice to communities who might simply be unaware of it. Connect with organizations such as the Inneract Project (http://www.inneractproject.org) and the Level Playing Field Institute (http://www.lpfi.org) to support their missions of increasing opportunities for underserved students. When recruiting and interviewing, adopt practices that focus on competencies and results, using tools that replace casual assessment with rigorous analysis of candidates’ work and behaviors. Every member of the team must demonstrate respect to every other member, or the openness required for successful collaboration will not emerge. Dismissiveness, insults, cattiness, and behind-the-back gossip lead to people feeling shamed and shut down, and cannot be tolerated. Instead, train the team to give authentic feedback and to deal with disagreements constructively. Earning one another’s respect is necessary in order for the team to “get real,” because frank and candid critique and feedback are essential for upholding the quality standards. Greatness comes from the tension and collision of different perspectives (a concept known as “creative abrasion”), addressed openly and honestly. Design teams that favor politeness over candor will rarely produce great work. Organizational hierarchy can stifle the free flow of ideas within a design organization—when senior people speak, it often stops the conversation. It’s now become cliche, but it’s worth repeating—great ideas can come from anywhere. Great design leaders encourage everyone to speak up, and, for themselves, wait to speak last, if at all. These leaders must also place their work alongside others, and accept others’ critique with grace and humility. The collaborative environment referred to so far has been figurative, but it also should be made literal. Great design work takes space—places to collaborate, whiteboards for sketching and ideation, walls to show work. And those spaces should be permanent, places where the team works and sees their work all around them. Not only does this encourage continual engagement from the team itself, such spaces enable people outside the team to quickly connect with the work. It literally demonstrates openness and transparency. And instead of having occasional big share-outs (that require preparation that takes time away from productivity), these spaces support frequent lightweight check-ins. This keeps the work on track, because if it begins to veer off-course, it is quickly corrected. If physical spaces are infeasible (e.g., offices are simply too small, people work in a remote or distributed fashion), make the extra effort to create such environments virtually. Thanks to a whole host of tools such as Basecamp, Slack, Trello, Mural, and others, it’s easier than ever for designers to collaborate online. Such solutions can never fully replace a well-stocked project room, and they require a little extra effort to make them useful, but with a little discipline they can prove quite satisfactory. Such symptoms make people feel like they are spinning their wheels, expending a lot of effort with little to show for it. Ironically, though, designers often resist practices and policies meant to streamline their work, concerned with how it may inhibit creativity. In other cases, too much process will mask deficiencies in other areas, such as lack of a clear strategy, vision, or roadmap, and doing the work feels too prescriptive and constrained. Accelerated hiring and inadequate—or non-existent—onboarding further exacerbate problems (there’s a section on onboarding in Chapter 8). If done well, team members will learn to appreciate the ability to remain focused on the work, instead of being sucked into the work-about-the-work that insidiously steals a surprising amount of time. Twentieth-century management practices were dominated by Scientific Management, which sought to squeeze the most productivity out of a workforce, and bureaucracy, which treated employees as interchangeable widgets. This mechanistic view of labor, where teams and individuals were considered solely on their output, worked in an economy dominated by the mass manufacturing of products. However, companies have brought it forward to the 21st-century challenge of connected software and services, and it proves tone deaf. Services hinge on relationships, and relationships occur between people. If a company has poor relationships with its own employees, how can it expect to have good ones with its customers? This humanistic orientation is even more important for the design team, as the very nature of their work exploits their humanity, from the empathy they draw from customer research to their design solutions expressing their perspectives. Use these 12 qualities as guidelines for assessing a design organization. Have all the team members score the organization against each quality, and use the results to identify areas that need work. By making it an inclusive, whole-team activity, you ensure that responsibility for improvement is shared by everyone, further strengthening the team’s bond. 1Available for download at http://adaptivepath.org/ideas/leveraging-business-value-how-roi-changes-user-experience1/. 2The levels Strategy, Structure, and Surface are informed by, though slightly altered, from Jesse James Garrett’s The Elements of User Experience (New Riders, 2010). 3From communication with Adam Cutler, Design Practices Director at IBM. Article image: Door 12. (source: Pixabay).